Posted September 1, 2017 by Erin Sherwood. Imagine your manager gives you a piece of paper and says, ‘I’d like you to write down an honest opinion you hold of me. It can be anything you like. I’m going to put it in a hat with all your colleagues’ feedback, and pick them out at random, so what you say will be completely anonymous’. Well, there’s an app for that now. Anonymous honesty app Sarahah has taken the social networking world by storm – dashing to the top of Apple’s App Store and racking up over 20 million users in a matter of weeks. Before it got hijacked on Snapchat and promptly exploded into the latest social media fad, Sarahah was unveiled with a simple, more niche purpose – to offer a new way for team members to give constructive feedback to each other in the workplace. And we like this idea. If Sarahah had remained confined to use within the workplace, it’d be a neat little feedback tool, beyond the antiquated survey. After all, one of the key principles of employee engagement is recognition (as shown in our Anatomy of an Engaged Employee Field Guide). 68% of employees who receive accurate and consistent feedback feel fulfilled in their jobs. And the desire for feedback is increasing as our workplaces continue to welcome Millennials to the fold – with 42% expecting to receive it every week (over twice the percentage of previous generations). When someone acknowledges the work we’re doing, we feel good because they’ve taken notice of our hard graft. And we all how important senior leaders and managers are in this. Which begs the question – why do as many as 65% of employees say they want more feedback? An app like Sarahah could work wonders in solving this issue. It allows for instantaneous feedback, and the anonymity of the messages is conducive to a greater level of honesty. Leading to a culture of openness, trust, and more productive teamwork. Here at H&H, we use TinyPulse to collect our anonymous feedback based on a weekly workplace question, which we share at our Monday Huddle. It’s a neat little tool that enables us to talk openly about any issues we’re having and anything we think we ought to do differently, in response to questions like ‘How happy are you at work?’ or ‘How would you rate your company’s culture?’ And it also allows us to send Cheers for Peers – to show our gratitude and appreciation for a job well done. But on the flip side, anonymous, unrestricted honesty could harbour its own issues. It’s all well and good when we’ve got positive things to say – but what about when we don’t? Feedback works both ways – it’s just as important to know where we’re going wrong as where we’re doing right. But when we know what we’re saying is hidden under the radar, we’re likely to be far less tactful. We might take the opportunity to angrily express our grievances about a sensitive workplace subject. Or we may decide to air our true feelings about a employee’s new ‘brilliant’ idea. If the floodgates of criticism were opened in secrecy, it could devolve a culture of openness and trust into one of veiled blame and shame. As well as potentially rubbing employees up the wrong way – or worse, causing incisive, lasting hurt or worry. After all, who could say they like to be criticised? Regardless of how we may welcome the opportunity to improve upon our mistakes, it’s generally never pleasant to hear bad things about ourselves or our performance. That’s because receiving criticism adversely affects our brains. It triggers anxiety and puts us on the defensive, while simultaneously impeding our cognitive ability to process the steps we need to take to act upon it – making us far less productive. But it’s not the feedback that’s the problem – it’s how it’s used (or indeed, abused). If it’s dished out in the right way, it can be both constructive and positive, whether anonymous or out in the open. Let us be clear – this absolutely doesn’t mean glossing over the negatives in favour of the positives. It just means framing them in the right way. So how can leaders – or peers – ensure they provide the right sort of feedback? While receiving criticism about our current performance might put a damper on our spirits, science tells us that when feedback focuses on our dreams and ambitions – and how to achieve them – we feel uplifted, open up, and even think more creatively, thanks to the dopamine released by our brains. So if we’ve got something negative to say – but we don’t want to cause undue offence or anxiety – contextualising our criticism, and framing it within an overarching aspiration or ambition, could be the panacea to inspiring and motivating employees to improve while also giving them that happy hit of dopamine. For instance, if an employee was struggling to contribute creative ideas to team meetings, you could frame this negative within their positive ambition – by noting that through working on their confidence, they’d find the capacity to (let’s say) broaden their skillset through tackling new creative challenges. This idea correlates perfectly with the idea of the Golden Circle, popularised by Simon Sinek. To truly inspire and resonate with people, you have to connect with their WHY – a fundamental sense of purpose to fuel their aspirational drive. Only through honesty can the fundamental issue be identified and ultimately fixed. That’s why the most open, trusting organisational cultures are often the most productive. But that doesn’t mean leaders should take the opportunity to really come down hard. The best leaders are honest, but also reassuring and inspiring – to ensure their message sticks (but in the right way). 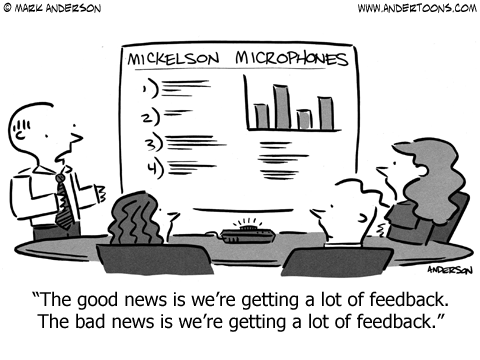 Providing constructive feedback is one of the best ways to build effective, self-aware teams. But however you go about it, always make sure that it’s given in the spirit of truly being constructive – and not destructive!